Download "UNDERGRADUATE CATALOG 2009 2011 ADDENDUM"
1 UNDERGRADUATE CATALOG ADDENDUM This addendum only lists additions and corrections to the Undergraduate Catalog. 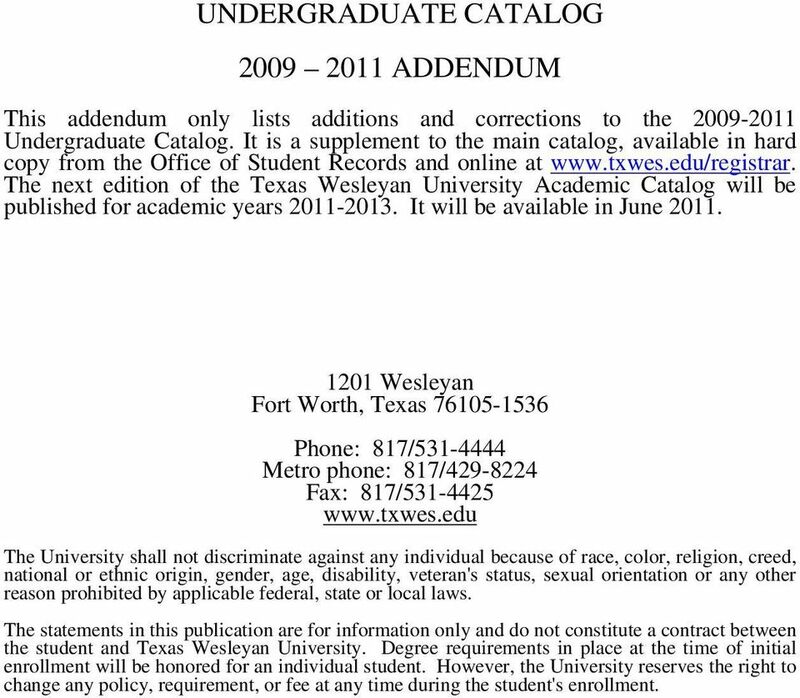 It is a supplement to the main catalog, available in hard copy from the Office of Student Records and online at The next edition of the Texas Wesleyan University Academic Catalog will be published for academic years It will be available in June Wesleyan Fort Worth, Texas Phone: 817/ Metro phone: 817/ Fax: 817/ The University shall not discriminate against any individual because of race, color, religion, creed, national or ethnic origin, gender, age, disability, veteran's status, sexual orientation or any other reason prohibited by applicable federal, state or local laws. 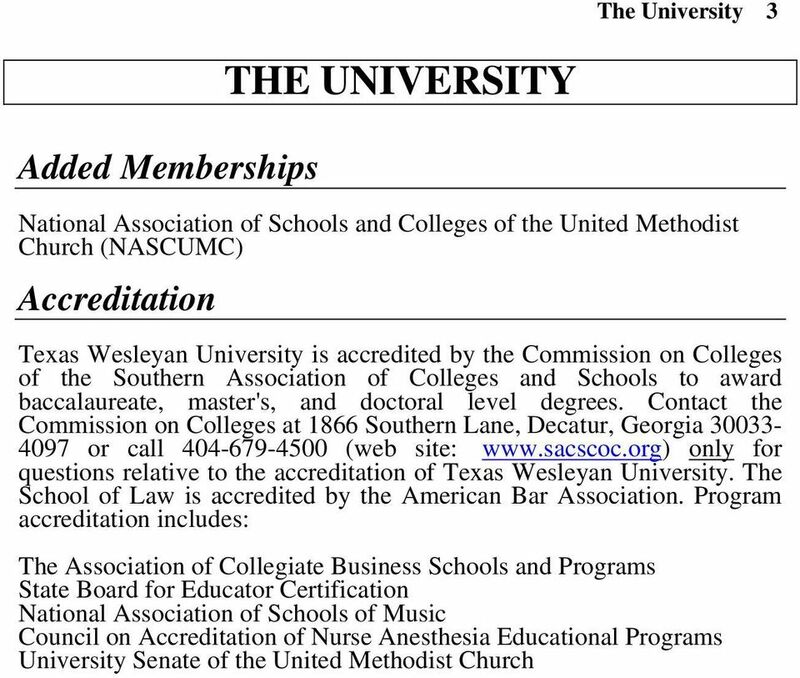 The statements in this publication are for information only and do not constitute a contract between the student and Texas Wesleyan University. Degree requirements in place at the time of initial enrollment will be honored for an individual student. However, the University reserves the right to change any policy, requirement, or fee at any time during the student's enrollment. 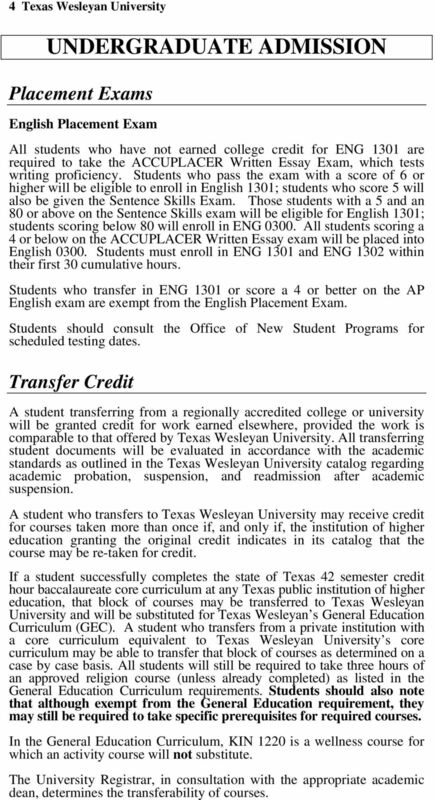 4 4 Texas Wesleyan University UNDERGRADUATE ADMISSION Placement Exams English Placement Exam All students who have not earned college credit for ENG 1301 are required to take the ACCUPLACER Written Essay Exam, which tests writing proficiency. Students who pass the exam with a score of 6 or higher will be eligible to enroll in English 1301; students who score 5 will also be given the Sentence Skills Exam. Those students with a 5 and an 80 or above on the Sentence Skills exam will be eligible for English 1301; students scoring below 80 will enroll in ENG All students scoring a 4 or below on the ACCUPLACER Written Essay exam will be placed into English Students must enroll in ENG 1301 and ENG 1302 within their first 30 cumulative hours. Students who transfer in ENG 1301 or score a 4 or better on the AP English exam are exempt from the English Placement Exam. Students should consult the Office of New Student Programs for scheduled testing dates. Transfer Credit A student transferring from a regionally accredited college or university will be granted credit for work earned elsewhere, provided the work is comparable to that offered by Texas Wesleyan University. 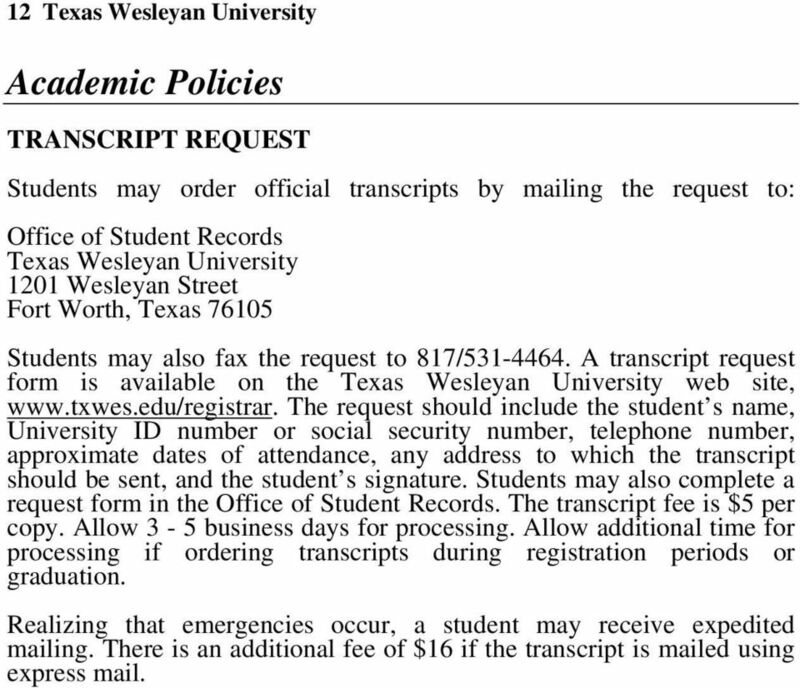 All transferring student documents will be evaluated in accordance with the academic standards as outlined in the Texas Wesleyan University catalog regarding academic probation, suspension, and readmission after academic suspension. A student who transfers to Texas Wesleyan University may receive credit for courses taken more than once if, and only if, the institution of higher education granting the original credit indicates in its catalog that the course may be re-taken for credit. 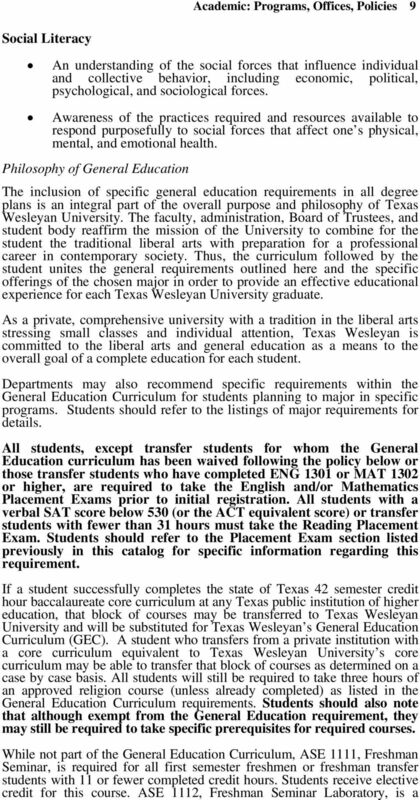 If a student successfully completes the state of Texas 42 semester credit hour baccalaureate core curriculum at any Texas public institution of higher education, that block of courses may be transferred to Texas Wesleyan University and will be substituted for Texas Wesleyan s General Education Curriculum (GEC). A student who transfers from a private institution with a core curriculum equivalent to Texas Wesleyan University s core curriculum may be able to transfer that block of courses as determined on a case by case basis. All students will still be required to take three hours of an approved religion course (unless already completed) as listed in the General Education Curriculum requirements. Students should also note that although exempt from the General Education requirement, they may still be required to take specific prerequisites for required courses. In the General Education Curriculum, KIN 1220 is a wellness course for which an activity course will not substitute. The University Registrar, in consultation with the appropriate academic dean, determines the transferability of courses. 5 Undergraduate Admission 5 The transfer of courses is subject to the limitations of the residency requirement for the major and for graduation. Transfer of courses is also limited by the provision that courses that were completed 10 or more years before matriculation may, at the discretion of the dean of the school in which the student is enrolled, have to be repeated. 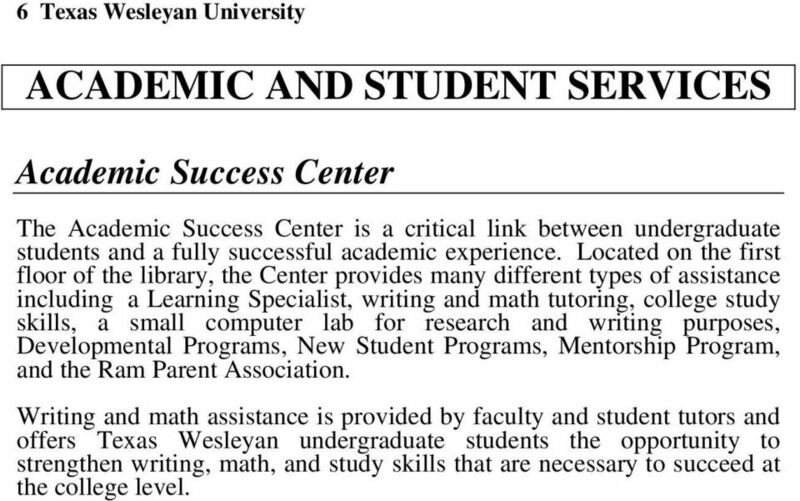 6 6 Texas Wesleyan University ACADEMIC AND STUDENT SERVICES Academic Success Center The Academic Success Center is a critical link between undergraduate students and a fully successful academic experience. Located on the first floor of the library, the Center provides many different types of assistance including a Learning Specialist, writing and math tutoring, college study skills, a small computer lab for research and writing purposes, Developmental Programs, New Student Programs, Mentorship Program, and the Ram Parent Association. Writing and math assistance is provided by faculty and student tutors and offers Texas Wesleyan undergraduate students the opportunity to strengthen writing, math, and study skills that are necessary to succeed at the college level. 8 8 Texas Wesleyan University Language Literacy Competency in a variety of communication skills o o This competency includes the ability to speak and write conventional English both clearly and correctly. The development of individual communicative style should also be encouraged. This competency also includes the ability to speak and write interactively. This includes elements of effective reading, listening, and analysis as well as the framing of appropriate and intelligible responses. 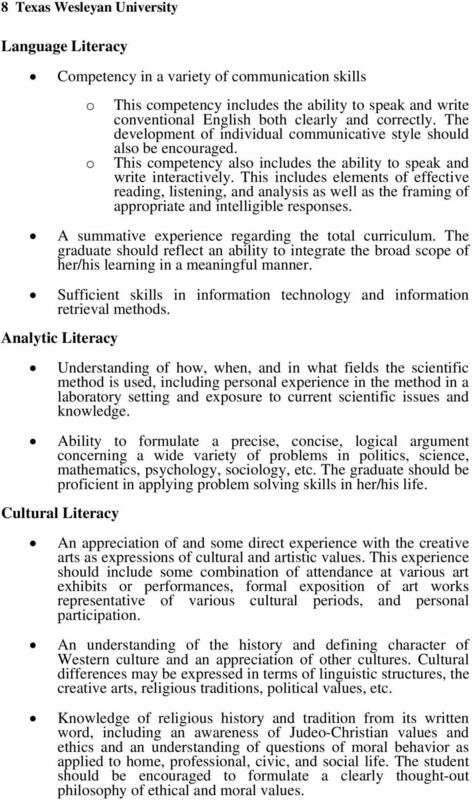 A summative experience regarding the total curriculum. The graduate should reflect an ability to integrate the broad scope of her/his learning in a meaningful manner. Sufficient skills in information technology and information retrieval methods. Analytic Literacy Understanding of how, when, and in what fields the scientific method is used, including personal experience in the method in a laboratory setting and exposure to current scientific issues and knowledge. Ability to formulate a precise, concise, logical argument concerning a wide variety of problems in politics, science, mathematics, psychology, sociology, etc. The graduate should be proficient in applying problem solving skills in her/his life. Cultural Literacy An appreciation of and some direct experience with the creative arts as expressions of cultural and artistic values. This experience should include some combination of attendance at various art exhibits or performances, formal exposition of art works representative of various cultural periods, and personal participation. An understanding of the history and defining character of Western culture and an appreciation of other cultures. Cultural differences may be expressed in terms of linguistic structures, the creative arts, religious traditions, political values, etc. Knowledge of religious history and tradition from its written word, including an awareness of Judeo-Christian values and ethics and an understanding of questions of moral behavior as applied to home, professional, civic, and social life. The student should be encouraged to formulate a clearly thought-out philosophy of ethical and moral values. 12 12 Texas Wesleyan University Academic Policies TRANSCRIPT REQUEST Students may order official transcripts by mailing the request to: Office of Student Records Texas Wesleyan University 1201 Wesleyan Street Fort Worth, Texas Students may also fax the request to 817/ A transcript request form is available on the Texas Wesleyan University web site, The request should include the student s name, University ID number or social security number, telephone number, approximate dates of attendance, any address to which the transcript should be sent, and the student s signature. Students may also complete a request form in the Office of Student Records. The transcript fee is $5 per copy. Allow 3-5 business days for processing. Allow additional time for processing if ordering transcripts during registration periods or graduation. Realizing that emergencies occur, a student may receive expedited mailing. There is an additional fee of $16 if the transcript is mailed using express mail. 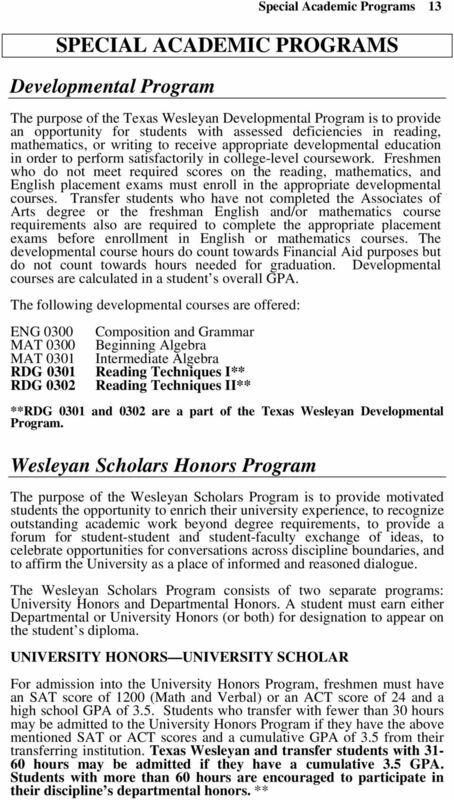 14 14 Texas Wesleyan University To qualify for University Honors recognition on their diploma, students must complete four (4), two-hour honors seminars in sequence and maintain a cumulative GPA of 3.5. **University Honors admission policies updated. 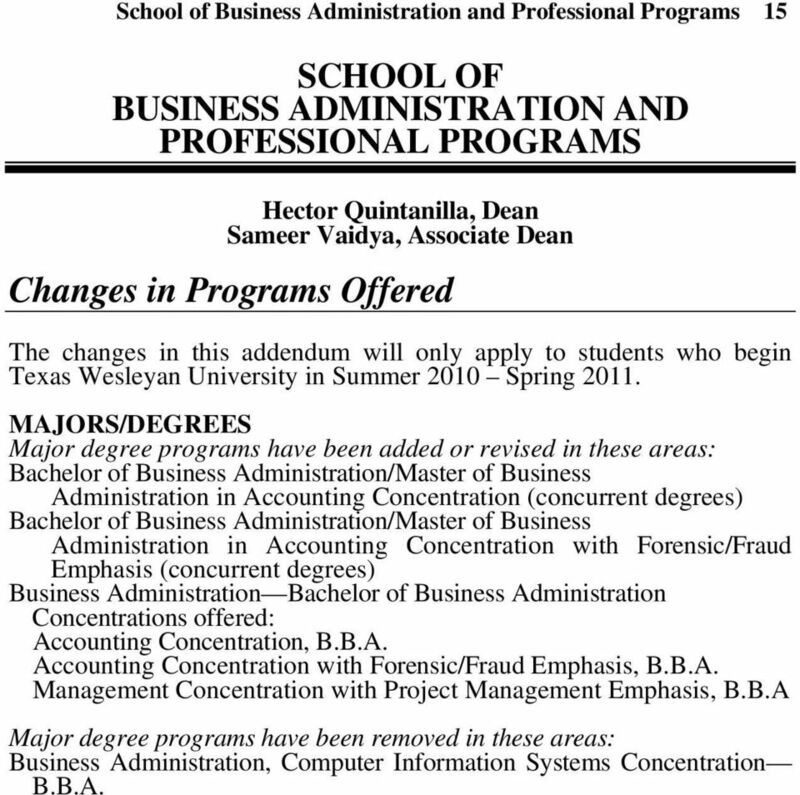 15 School of Business Administration and Professional Programs 15 SCHOOL OF BUSINESS ADMINISTRATION AND PROFESSIONAL PROGRAMS Hector Quintanilla, Dean Sameer Vaidya, Associate Dean Changes in Programs Offered The changes in this addendum will only apply to students who begin Texas Wesleyan University in Summer 2010 Spring MAJORS/DEGREES Major degree programs have been added or revised in these areas: Bachelor of Business Administration/Master of Business Administration in Accounting Concentration (concurrent degrees) Bachelor of Business Administration/Master of Business Administration in Accounting Concentration with Forensic/Fraud Emphasis (concurrent degrees) Business Administration Bachelor of Business Administration Concentrations offered: Accounting Concentration, B.B.A. 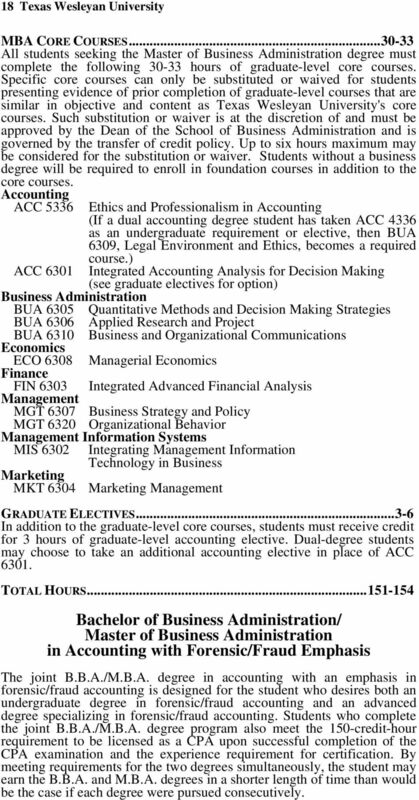 Accounting Concentration with Forensic/Fraud Emphasis, B.B.A. Management Concentration with Project Management Emphasis, B.B.A Major degree programs have been removed in these areas: Business Administration, Computer Information Systems Concentration B.B.A. 17 School of Business Administration and Professional Programs 17 Speech SPC 1301 Fundamentals of Speech* UNDERGRADUATE MAJOR REQUIREMENTS Business Core Curriculum Students should review catalog course descriptions for any course prerequisites before registration. Students are not allowed to register for a course unless they satisfy all course prerequisites. Foundation Courses Accounting... 6 ACC 2303 Principles of Financial Accounting ACC 2304 Principles of Managerial Accounting Economics... 3 ECO 2306 Principles of Economics II Microeconomics) Finance... 3 FIN 3313 Corporate Finance Management... 6 MGT 3319 Management Theory and Practice MGT 3323 Production/Operations Management** Management Information Systems... 3 MIS 3305 MIS Analysis and Design Marketing... 3 MKT 3321 Principles of Marketing Related Courses... 9 Business Administration... 9 BUA 2321 Business Statistics BUA 3301 Business Communications BUA 3311 Business Law I Capstone Course Management MGT 4337 Business Policy and Decision Making (may be waived for dual accounting degree students) Accounting Concentration ACC 3311 Intermediate Accounting I ACC 3312 Intermediate Accounting II ACC 3325 Accounting and Financial Information Systems ACC 3340 Cost Accounting I ACC 4301 Federal Income Taxation I ACC 4307 Accounting Theory (Accounting Research Course) ACC 4311 Advanced Accounting ACC 4328 Auditing ACC 4332 Introduction to Fraud Examination Business Advanced Electives... 0 requirement fulfilled by M.B.A. courses UNDERGRADUATE ELECTIVES ** MGT 3323 added to business core. 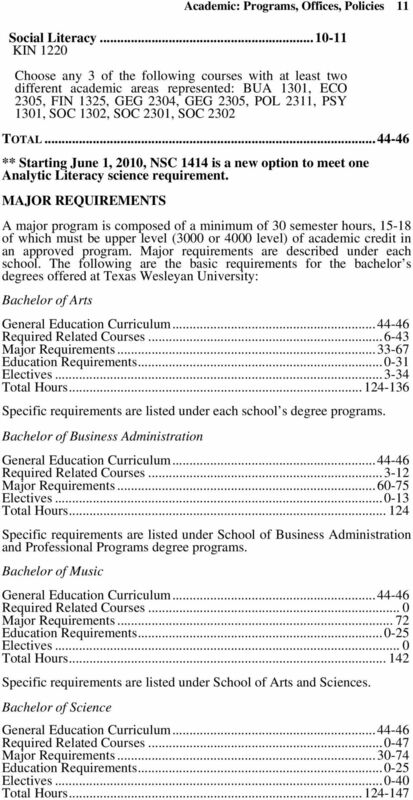 18 18 Texas Wesleyan University MBA CORE COURSES All students seeking the Master of Business Administration degree must complete the following hours of graduate-level core courses. Specific core courses can only be substituted or waived for students presenting evidence of prior completion of graduate-level courses that are similar in objective and content as Texas Wesleyan University's core courses. Such substitution or waiver is at the discretion of and must be approved by the Dean of the School of Business Administration and is governed by the transfer of credit policy. Up to six hours maximum may be considered for the substitution or waiver. Students without a business degree will be required to enroll in foundation courses in addition to the core courses. Accounting ACC 5336 ACC 6301 Ethics and Professionalism in Accounting (If a dual accounting degree student has taken ACC 4336 as an undergraduate requirement or elective, then BUA 6309, Legal Environment and Ethics, becomes a required course.) 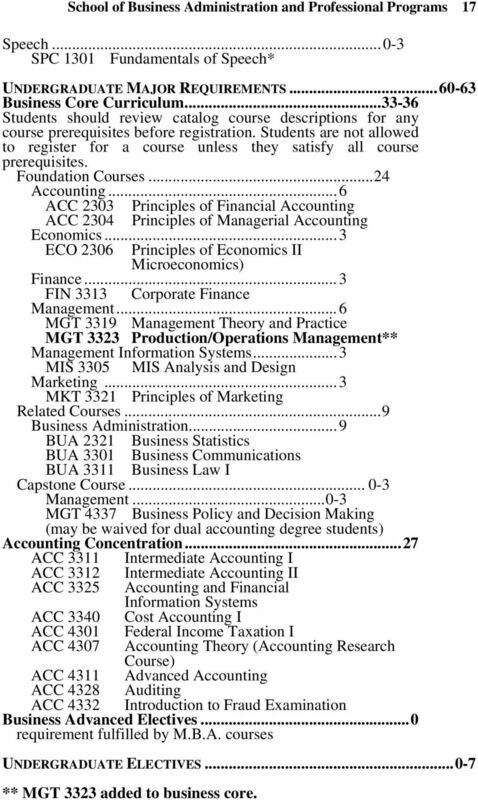 Integrated Accounting Analysis for Decision Making (see graduate electives for option) Business Administration BUA 6305 Quantitative Methods and Decision Making Strategies BUA 6306 Applied Research and Project BUA 6310 Business and Organizational Communications Economics ECO 6308 Managerial Economics Finance FIN 6303 Integrated Advanced Financial Analysis Management MGT 6307 Business Strategy and Policy MGT 6320 Organizational Behavior Management Information Systems MIS 6302 Integrating Management Information Technology in Business Marketing MKT 6304 Marketing Management GRADUATE ELECTIVES In addition to the graduate-level core courses, students must receive credit for 3 hours of graduate-level accounting elective. Dual-degree students may choose to take an additional accounting elective in place of ACC TOTAL HOURS Bachelor of Business Administration/ Master of Business Administration in Accounting with Forensic/Fraud Emphasis The joint B.B.A./M.B.A. degree in accounting with an emphasis in forensic/fraud accounting is designed for the student who desires both an undergraduate degree in forensic/fraud accounting and an advanced degree specializing in forensic/fraud accounting. Students who complete the joint B.B.A./M.B.A. degree program also meet the 150-credit-hour requirement to be licensed as a CPA upon successful completion of the CPA examination and the experience requirement for certification. By meeting requirements for the two degrees simultaneously, the student may earn the B.B.A. and M.B.A. degrees in a shorter length of time than would be the case if each degree were pursued consecutively. 19 School of Business Administration and Professional Programs 19 Applicants are initially admitted into the Bachelor of Business Administration with a major in Business Administration and an Accounting Concentration with Forensic/Fraud Emphasis and follow that program s requirements. Students may apply for admission into the M.B.A. program upon completion of 90 undergraduate credit hours in their junior year and are admitted to the M.B.A. program in their senior year. When a student has earned 115 credit hours and has been admitted into the M.B.A. program, they may choose to remain in their original undergraduate catalog year for graduate school or change to the current graduate catalog year. Applicants to the joint degree program must meet the admission requirements of both the undergraduate and the graduate programs and follow the application procedures for the respective programs. 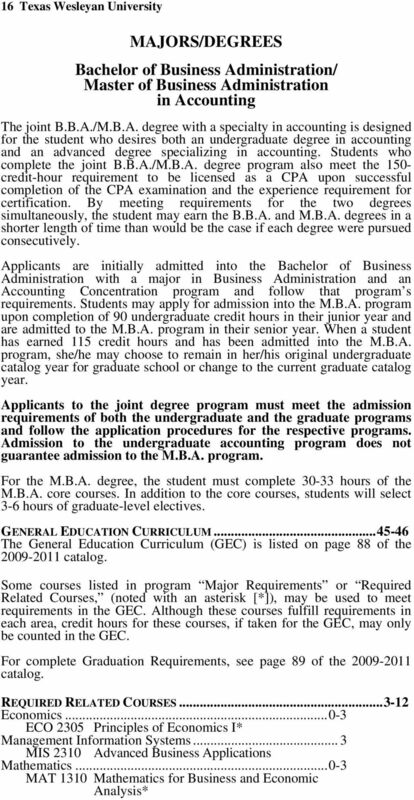 Admission to the undergraduate accounting program does not guarantee admission to the M.B.A. program. For the M.B.A. degree, the student must complete 30 hours of the M.B.A. core courses as well as 13 hours in Forensic/Fraud Accounting. GENERAL EDUCATION CURRICULUM The General Education Curriculum (GEC) is listed on page 88 of the catalog. 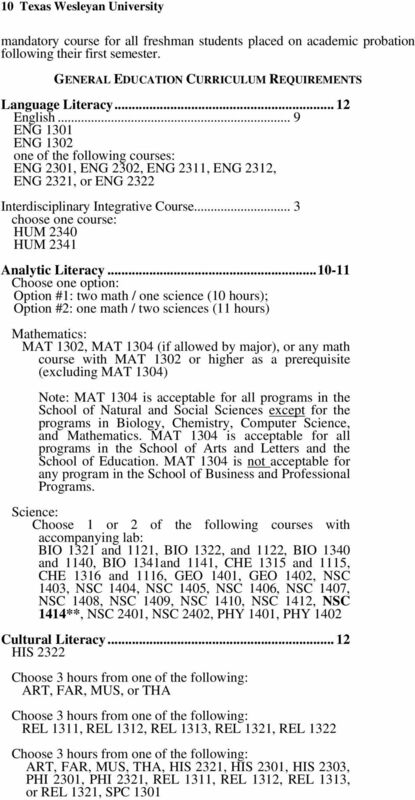 Only MAT 1302 is acceptable for the GEC math requirement. 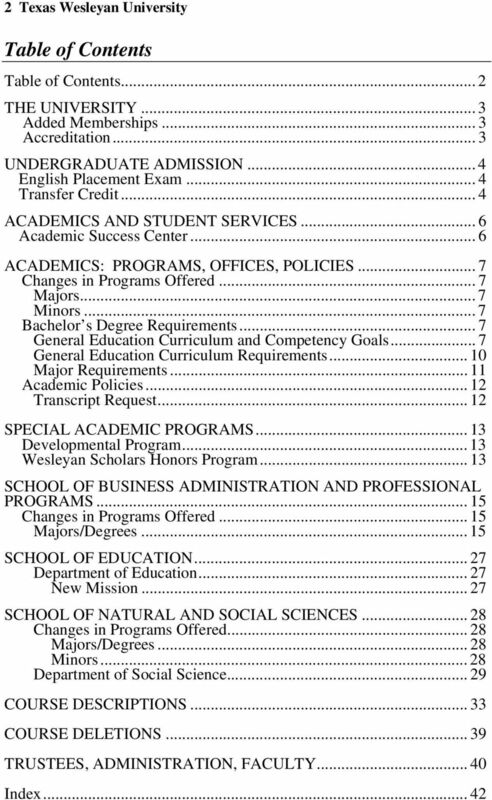 Some courses listed in program Major Requirements or Required Related Courses, (noted with an asterisk [*]), may be used to meet requirements in the GEC. Although these courses fulfill requirements in each area, credit hours for these courses, if taken for the GEC, may only be counted in the GEC. REQUIRED RELATED COURSES Criminal Justice... 3 CRJ 3310 White Collar Crime/Corporate Crime** Economics ECO 2305 Principles of Economics I* Management Information Systems... 3 MIS 2310 Advanced Business Applications Mathematics MAT 1310 Mathematics for Business and Economic Analysis* Speech SPC 1301 Fundamentals of Speech* *Students pursuing this emphasis should take ECO 2305, MAT 1310 and SPC 1301 as part of their GEC. **Students pursuing this emphasis must take Criminal Justice (CRJ 3310) as a required related course. This course must be taken before enrolling for ACC 4332 Introduction to Fraud Examination. UNDERGRADUATE MAJOR REQUIREMENTS Business Core Curriculum Students should review catalog course descriptions for any course prerequisites before registration. Students are not allowed to register for a course unless they satisfy all course prerequisites. 21 School of Business Administration and Professional Programs 21 Business Administration BUA 6305 Quantitative Methods and Decision Making Strategies BUA 6306 Applied Research and Project BUA 6310 Business and Organizational Communications Economics ECO 6308 Managerial Economics Finance FIN 6303 Integrated Advanced Financial Analysis Management MGT 6307 Business Strategy and Policy MGT 6320 Organizational Behavior Management Information Systems MIS 6302 Integrating Management Information Technology in Business Marketing MKT 6304 Marketing Management FORENSIC/FRAUD ACCOUNTING EMPHASIS ACC 5332 Introduction to Fraud Examination ACC 5433 Forensic/Fraud IT Audit ACC 5334 The Legal Environment and Fraud ACC 5335 Forensic/Fraud Practicum TOTAL HOURS Business Administration Bachelor of Business Administration Students seeking a bachelor of business administration degree must complete a minimum of 124 credit hours. Depending upon a student s concentration, the actual number of required credit hours may be greater than 124 credit hours. Students must successfully complete the University s General Education Curriculum requirements, which total credit hours for business administration majors. All business administration students must satisfactorily complete the core curriculum of the School of Business Administration and Professional Programs. The core consists of 39 credit hours. Each concentration within the School of Business Administration and Professional Programs requires additional hours specific to the concentration. Students majoring in business administration also take business-advanced electives as required by the particular concentration. 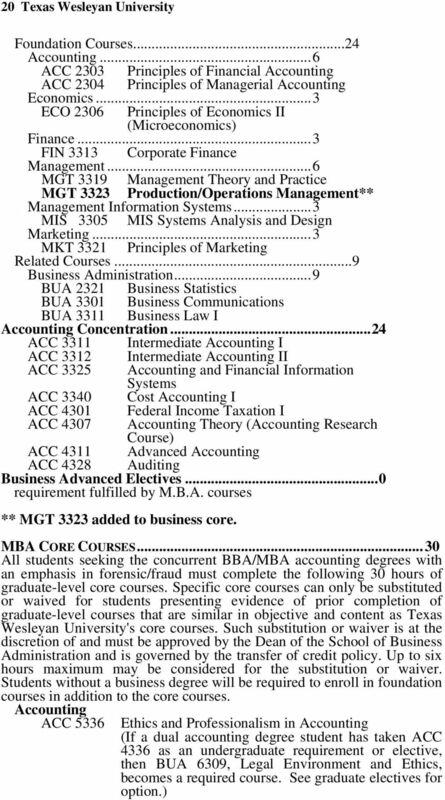 In addition, business majors must take a minimum of 3 hours of required related courses. If needed, students must take free elective credit hours to complete the number of hours required to obtain the bachelor of business administration degree. No more than 6 hours of business transfer credits with a grade of "D" will apply toward major requirements, and no transfer grades of "D" will apply towards concentration courses. In addition, a maximum of 6 hours of transfer credits may be applied to satisfy a concentration requirement. GENERAL EDUCATION CURRICULUM The General Education Curriculum (GEC) is listed on page 88 of the catalog. 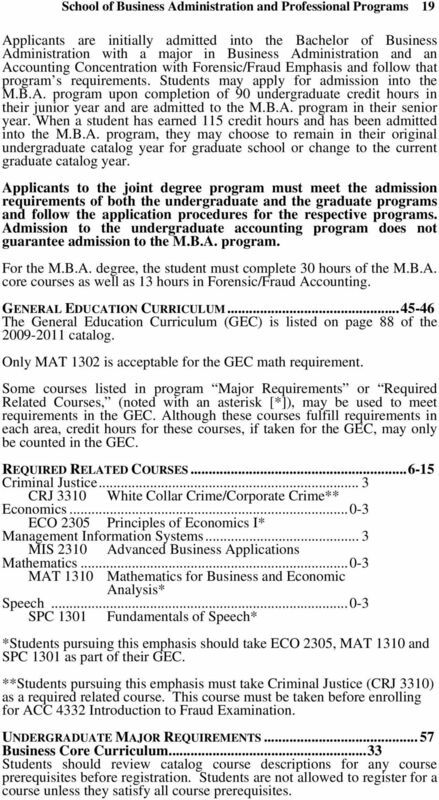 Only MAT 1302 is acceptable for the GEC math requirement. 27 New Mission School of Education/Education 27 SCHOOL OF EDUCATION Carlos Martinez, Dean DEPARTMENT OF EDUCATION Lisa Dryden, Chair The undergraduate Department of Education is committed to the preparation of reflective professionals who are knowledgeable in working collaboratively in diverse educational settings. To that end, the Department provides a student-centered, intellectual environment that promotes quality instruction and research. Our graduates will: Acquire and demonstrate knowledge, skills and understandings of appropriate best practices in school settings, Support and create environments for excellence in learning, Participate in and contribute to complex and diverse settings. VII. 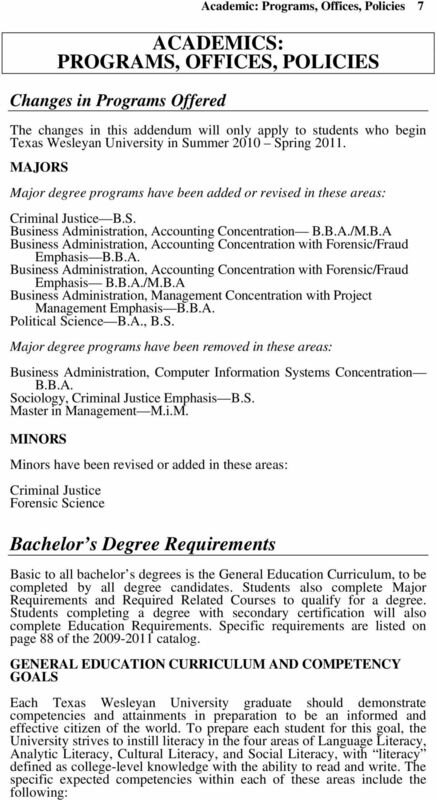 BACHELOR'S DEGREE REGULATIONS 68/ BACHELOR'S DEGREE REGULATIONS DEGREE REQUIREMENTS In order to receive a bachelor's degree from UT San Antonio, a student must comply with the following minimum requirements. TRANSFER ARTICULATION AGREEMENT between DOMINICAN COLLEGE and MERCER COUNTY COMMUNITY COLLEGE General Stipulations Mercer County Community College (MCCC) students who graduate with an A.A., A.S., or A.A.S.